As you can see from the above charts, July and August appear to have the warmest temperatures and the least amount of rainfall, and one would think that you'd not have to worry about severe Yellowstone National Park weather. HOWEVER, even though these months are generally very pleasant over all, there are ALWAYS storms that can come through that significantly lowers the daytime temperatures to the low 50's or even lower, and it can even snow in the middle of summer! Yellowstone Park weather can be very unpredictable, and all visitors need to bring the appropriate clothing to help make their Yellowstone National Park vacation as comfortable as possible. The bottom line is that you really never know what you're going to get as far as weather in Yellowstone National Park is concerned, so be prepared for all types of weather conditions, whether it be hot weather, cold weather, wet weather, or even snow. Here's a tip: LAYER your clothing! Layering allows you to easily change with the ever-changing weather in Yellowstone National Park, even minute to minute. By layering, you can slip on or slip off layers as the conditions warrant. For example: It's best to wear a thin synthetic shirt (polyester, etc) and have a light polyester fleece jacket that you can quickly put on or take off. You will also need a light weight, water proof, wind blocking, and breathable polyester outer shell with Gore Tex or equivalent. This standard 3 layer system that works really well during the summer months in Yellowstone National Park. So when the Yellowstone Park weather changes, you can change with it, easily and quickly. In addition to what we've just mentioned, also bring light weight, water proof, and breathable rain pants that you can quickly slide on over your regular shorts or pants. We also recommend that you bring a polyester or wool hat and a pair or gloves... just in case the weather in Yellowstone Park really takes a nose dive. Again, Yellowstone National Park weather is extremely unpredictable. 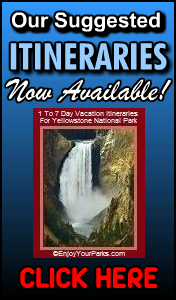 During the hot summer Yellowstone Park days in July and August, afternoon and evening thunderstorms occur on a regular basis. With these thunderstorms come rain, and sometimes a lot of rain all at once called a "cloud burst" . These thunderstorms usually come and go quite quickly, but if you're out hiking and not prepared, you can get really really wet. Potentially this situation can become a serious problem if the outside temperature only drops to even 55 to 60 degrees Fahrenheit. This is because if you're clothes are soaked and you're wet, you're body temperature may begin to drop if you don't get warm and dry quickly. If your core body temperature drops below 95 degrees F, then you will become hypothermic. The early symptoms of hypothermia are shivering and mental confusion, and eventually death can be the result if left untreated. The biggest misconception about hypothermia is that it has to be really cold outside to get it. The truth is that many hypothermia cases occur during the warmest months of the year. This is because unsuspecting hikers do not have proper clothing with them if the weather begins to deteriorate from a warm summer morning into a cold, wet afternoon. It doesn't take a winter day to cause your body temperature to drop, so whenever you're hiking in Yellowstone National Park, make sure you bring appropriate clothing that can handle all types of weather. And make sure the materials you choose are synthetic (polyester) or wool. Cotton materials are not recommended for outdoor activities because it can further drop your core temperature if it gets wet. The bottom line is this: Yellowstone National Park weather can change in an instant. It can be warm and sunny one minute, and pouring rain and cold the next, so park visitors need to be prepared for all weather situations, even during the warmest months of the year. 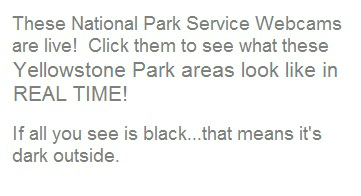 check out our ebook entitled "The Ultimate National Park Checklist".